Add warmth and a distinctive touch to a favorite room in your house with this floor lamp. The lamp is handcrafted using opaque glass and clear glass giving off glimmering iridescents that radiate soft colorful tones. This Torchiere lamp features a classic style to fit in any room. This lamp is handcrafted using the same techniques that were developed by Louis Comfort Tiffany in the early 1900s. Note: Shade colors will appear darker and less vibrant when not illuminated. WARNING: Attention California residents: This product contains lead, a chemical known to the State of California to cause cancer and birth defects or other reproductive harm. This stained glass product has been protected with mineral oil as part of the finishing process. Please use a soft dry cloth to remove any excess oil. 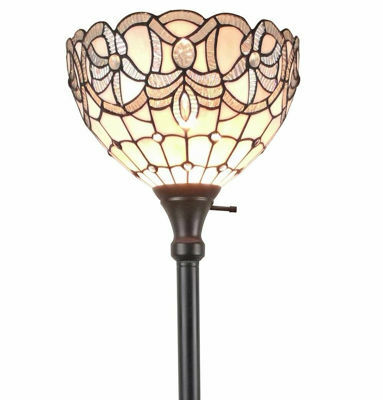 Decorate with gorgeous tiffany style mission floor lamp provide creative, innovative, and beautiful lighting so that everyone can have quality, high-end lighting in their home and office. The beautiful Tiffany-style floor lamp piece contains hand-cut pieces of stained glass, each wrapped in fine copper foil. with 63-inch height & 11-inch Diameter. Tiffany style lamp featuring 54 glass pieces. with the Incandescent type of bulb. this 18 Inches wide floor lamp offers a warm glow to deliver a welcoming ambiance. Elevate the traditional style of your living room or bedroom. Attractive White to make an attention-grabbing statement in your home. Decorate with gorgeous tiffany style Torchiere Floor Lamp provide creative, innovative, and beautiful lighting so that everyone can have quality, high-end lighting in their home and office. The beautiful Tiffany-style floor lamp piece contains hand-cut pieces of stained glass, each wrapped in fine copper foil. with 72 inch height & 12-inch Diameter. Tiffany style lamp 306 pieces of stained glass. with the Incandescent type of bulb. this 12 Inches wide floor lamp offers a warm glow to deliver a welcoming ambiance. Elevate the traditional style of your living room or bedroom. Attractive White color finish making an attention-grabbing statement in your home. This unique Tiffany-style lamp has been handcrafted using methods first developed by Louis Comfort Tiffany. The shade contains pieces of stained glass, each hand-cut and wrapped in fine copper foil, with a breathtaking pattern of dragonflies arranged around the top. Features 282 glass pieces and 66 beads. Floor knob switch type. UL listed for safety and efficiency.